Stableford - The players score points on each hole according to their score, the winner being the one whose total points are the highest at the end of the round. Each player receives a number of strokes equivalent to their handicap. These points are awarded according to the degree of difficulty of the holes. (For example, a player with a handicap of 10 receives 1 point on the 10 most difficult holes, a player with a handicap of 20 receives 2 points on the 2 most difficult holes and 1 point on the other 16 holes). The net scores are recorded accordingly. Matchplay - The game is played hole by hole. A hole is won by the player who takes the least number of strokes on the hole. 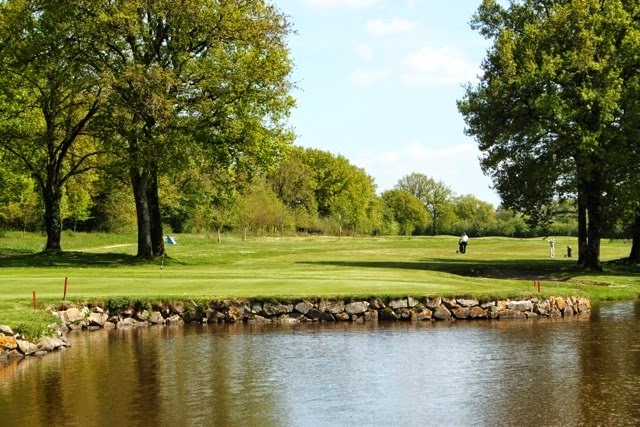 The match is finished when one of the players has won more holes than there are left to play. Strokeplay - All stokes played are counted, and this can be played without handicap (brut) or with handicap (net). Foursomes - Each team of two has a single ball in which play is struck alternately by each of the partners. Only one ball is therefore hit per team. One partner take the even tees, and the other the odd tees. Greensomes - At the start of each home each partner hits a ball. For the 2nd stroke, they choose which ball they prefer, and take alternate shots intil the end of that hole. Fourball - The 2 partners each play a ball until the hole is finished. The score to be counted will be the better of the 2 players.